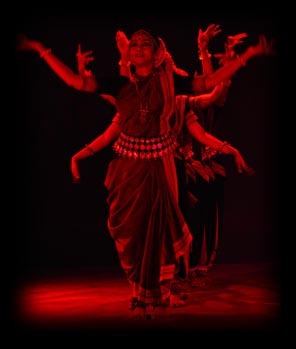 This production is a sojourn seeking to rediscover devi. In the year of woman empowerment, my mind was in an introspective phase and the thought process precipitated in the form of script for this production. ‘In Search of Devi’ seeks to redefine devi in the modern scenario in addition to tracing its concept in Vedas, Puranas and other works of regional literature. The script is an attempt to weave together the multi-layered meaning of devi – as a deity, as dispeller of evil, as a ragini (melodic mood), as eternal time manifested, as motherland, as an activist woman adhering to righteousness and truth, and of course, as a mother. References in few hymns of Rigveda of this vedic goddess seem to equate her with death, ill luck and destruction. The concern of the hymn is to seek protection from her or to ask her that she be driven away. She thus represents a dark side of the vedic vision of divine feminine. Nirrti in- spired me to understand that there is and should be a negative aspect of every thing that exists in this universe – concrete or subtle. I have chosen to delineate internalised and intense dance movements with the traditional style of vedic chant in this piece. This is one of the many masterpieces of the great genius and reviver of Odissi – Guru Kelucharan Mohapatra. The classical Sanskrit verse is complemented with cadences of movements and carefully sculpted gestures. The composition describes devi in an unusual way – playing the jewel studded Veena, her speech divine, daughter of Matanga Rishi, adorned with weapons like pasha, ankusha and pushpa bana; the woods being her dwelling, she is a sangeet rasika. The eternal time is all pervading and manifests itself in move- ments of heavenly bodies and life, growth and death of living beings. Time is essentially rhythmic and cyclic in nature and is manifested as taal in performing arts. Kala in its creative and destructive aspects is visualised as a devi-embodiment of time. An abstract rhythmic piece set to a time cycle of 5 beats symbolising the five constituent elements of creation. Mother Nature (prakrti) finds references in the ancient vedic literature. A Dhrupad chosen to portray prakrti suggests the devi as adorned in ‘red’ signifying fertility and creation. Radha is rebellious in her attitude, defying her fate and society. Her role as the ideal human devotee is necessarily played down as her divine status as Krishna’s shakti is emphasised. Some ancient texts like Brahma Vaivarta Purana elevates Radha to such an extent that in several places it states that she is superior in status to Krishna himself. His support, he says, is Radha upon whom he rests eternally. She alone, by implication has no support and as such, is the supreme reality. Excerpts from ‘Radha’ by renowned Marathi litterateur Narahar Kurundkar portraying this devi provides a different dimension. A melodic mood – raga or ragini evoked by an artist is equated with the divine. According to ancient Indian wisdom, each raga or ragini has particular characteristics and should be worshiped as deities. Ragini Saveri has been described as an enchantress dwelling in the woods. A pallavi set to this ragini attempts to explore the essence on a visual and temporal plane. The warrior goddess durga is depicted as a great battle queen and is described as irresistible in battle. I perceive her as a symbol of victory of truth over falsehood, of the sacred over the evil. The concept of asura and asura mardini is as universal as the sun-rise and sun-set and finds validity in every region or belief in the world. A piece from the Bangla poem ‘Ahvaan’ by Ravindranath Tagore addresses woman as the heavenly ambassador, who conceals inside her mortal being the divine nectar ‘amrita’ in the guise of death. He pleads her to raise her sword of divine aura and slay away all that is dark and untrue. Markandeya Purana describes Devi in her various manifestations. The shlokas address her as gauri, narayani, maheshwari, durga, bhadrakali. An important aspect of the reverence for the divine feminine in the Indian tradition is an a we for the sacrality of the land itself and for the Indian subcontinent as a whole. India is a devi and mother with all Indians as its children. One of the earliest and probably still the most popular literary expressions of this theme is Bankim Chandra Chattopadhhyaya’s ‘Anand Math’. The hymn ‘vande mataram’ became a symbol of the independence movement in India and still continues to be a slogan that pulsates with patriotism. The warrior queen was instrumental in uniting the Maratha rulers to fight against the British. We salute to the martyr devi who taught us to be fearless and to fight against all odds. A famous Hindi poem by Subhadra Kumari Chauhan glorifies the deeds of Rani Lakshmibai. The world we live in is a strange combination of the privileged and the deprived. There are many unsung devis around the world who are deprived of their basic social and moral rights. Woman is still a symbol of ill-luck and degradation in various parts of the world. It is impossible to conclude without paying our respect to all those women who at various levels are consistently fighting against injustice and striving to reinstate the honour of wom-anhood. We bow to all women who have dedicated their lives to the cause of service to mankind and preservation and promotion of our tradition and to all mothers for making this world breath with faith, affection and forgiveness. The journey ends with the traditional dance item ‘moksha’ seeking to evoke the formless through forms. This is followed by shlokas from Markandeya Purana paying obeisance to devi. ‘In Search of Devi’ is an attempt to honour and glorify the various manifestations of devi around us in the form of teachers, nurses, social workers, etc., my mother – snehalata and all mothers of the world- past, present and future.